Orrorin tugenensis is a postulated early species of Homininae, estimated at 6.1 to 5.7 million years (Ma) and discovered in 2000. It is not confirmed how Orrorin is related to modern humans. Its discovery was an argument against the hypothesis that australopithecines are human ancestors, as much as it still remains the most prevalent hypothesis of human evolution as of 2012. The distal phalanx of the thumb. The name of genus Orrorin (plural Orroriek) means "original man" in Tugen, and the name of the only classified species, O. tugenensis, derives from Tugen Hills in Kenya, where the first fossil was found in 2000. As of 2007, 20 fossils of the species have been found. The 20 specimens found as of 2007 include: the posterior part of a mandible in two pieces; a symphysis and several isolated teeth; three fragments of femora; a partial humerus; a proximal phalanx; and a distal thumb phalanx. Orrorin had small teeth relative to its body size. Its dentition differs from that found in Australopithecus in that its cheek teeth are smaller and less elongated mesiodistally and from Ardipithecus in that its enamel is thicker. The dentition differs from both these species in the presence of a mesial groove on the upper canines. The canines are ape-like but reduced, like those found in Miocene apes and female chimpanzees. Orrorin had small post-canines and was microdont, like modern humans, whereas robust australopithecines were megadont. In the femur, the head is spherical and rotated anteriorly; the neck is elongated and oval in section and the lesser trochanter protrudes medially. 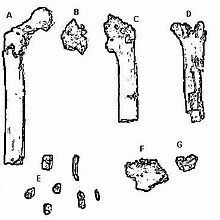 While these suggest that Orrorin was bipedal, the rest of the postcranium indicates it climbed trees. While the proximal phalanx is curved, the distal pollical phalanx is of human proportions and has thus been associated with toolmaking, but should probably be associated with grasping abilities useful for tree-climbing in this context. After the fossils were found in 2000, they were held at the Kipsaraman village community museum, but the museum was subsequently closed. Since then, according to the Community Museums of Kenya chairman Eustace Kitonga, the fossils are stored at a secret bank vault in Nairobi. If Orrorin proves to be a direct human ancestor, then australopithecines such as Australopithecus afarensis ("Lucy") may be considered a side branch of the hominid family tree: Orrorin is both earlier, by almost 3 million years, and more similar to modern humans than is A. afarensis. The main similarity is that the Orrorin femur is morphologically closer to that of H. sapiens than is Lucy's; there is, however, some debate over this point. Other fossils (leaves and many mammals) found in the Lukeino Formation show that Orrorin lived in a dry evergreen forest environment, not the savanna assumed by many theories of human evolution. The team that found these fossils in 2000 was led by Brigitte Senut and Martin Pickford from the Muséum national d'histoire naturelle. The 20 fossils have been found at four sites in the Lukeino Formation, located in Kenya: of these, the fossils at Cheboit and Aragai are the oldest (6.1 Ma), while those in Kapsomin and Kapcheberek are found in the upper levels of the formation (5.7 Ma). ^ Reynolds, Sally C; Gallagher, Andrew (2012-03-29). African Genesis: Perspectives on Hominin Evolution. ISBN 9781107019959. ^ "Whereabouts of fossil treasure sparks row". Daily Nation. May 19, 2009. Retrieved December 1, 2010. CogWeb. "Orrorin Tugenensis: Pushing back the hominin line". UCLA. Retrieved December 1, 2010. Haviland, William A.; Prins, Harald E. L.; Walrath, Dana; McBride, Bunny (2007). Evolution and prehistory: the human challenge. Cengage Learning. ISBN 0-495-38190-X. Henke, Winfried (2007). Henke, Winfried; Hardt, Thorolf; Tattersall, Ian (eds.). Handbook of paleoanthropology: Phylogeny of hominids. Springer. pp. 1527–9. ISBN 978-3-540-32474-4. Pickford, Martin (December 2001). "Martin Pickford answers a few questions about this month's fast breaking paper in field of Geosciences". Essential Science Indicators. Senut, Brigitte; Pickford, Martin; Gommery, Dominique; Mein, Pierre; Cheboi, Kiptalam; Coppens, Yves (2001). "First hominid from the Miocene (Lukeino Formation, Kenya)" (PDF). Comptes Rendus de l'Académie des Sciences. 332 (2): 137–144. Bibcode:2001CRASE.332..137S. doi:10.1016/S1251-8050(01)01529-4. Archived from the original (PDF) on February 26, 2014. Retrieved November 1, 2012. Wikimedia Commons has media related to Orrorin.